Details: Wariam Singh was convicted by the court of Designated Judge of Pillibhit (U.P.) on 10 January 1995 under sections 3 and 4 of TADA Act and Section 120-B of IPC. He is facing imprisonment for life. He was arrested on 17 April, 1990 and remains confined in jail till date. He has spent nearly 24 years in prison. He was never released from jail since the date of his arrest. His jail record was clean and there was no post conviction crime. It is pertinent to note that his co-accused Major Singh who was facing same sentenced pronounced by same court in same case was granted permanent release by Uttar Pradesh Government in 2013, but he still remains confined in jail. 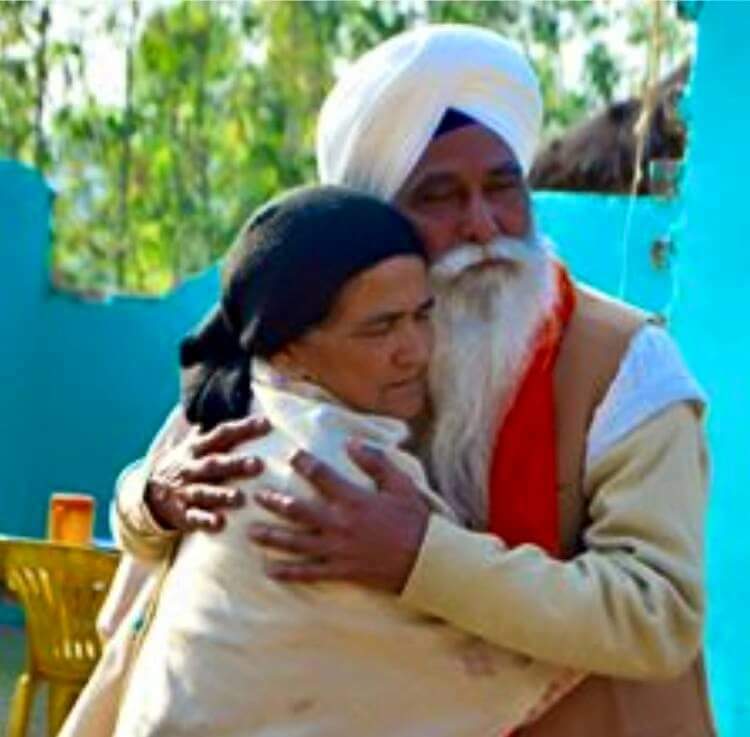 IBAREILLY, Uttar Pradesh, India—Sikh political prisoner Bhai Waryam Singh was yesterday released permanently from the Bareilly Jail of Uttar Pradesh. It is notable that Bhai Waryam Singh had been held in the jail for over than 25 years under charges of TADA (Terrorists and Disruptive Activities Prevention Act). The UP government had recommended his name to the Central government for release, keeping in view his good conduct during imprisonment. Jail Minister of Uttar Pradesh S. Balwant Singh Ramuwalia had visited him in Bareilly jail only few months earlier and had collected information about his case. 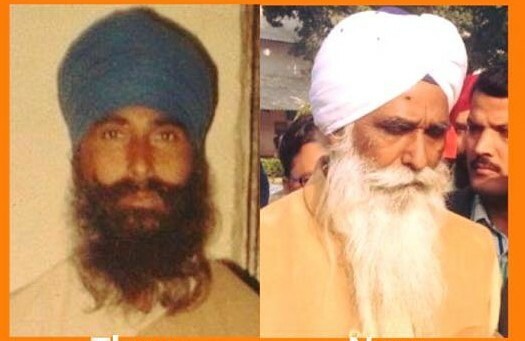 With the intervention of S. Balwant Singh Ramuwalia, Bhai Waryam Singh has been released on parole for the first time. 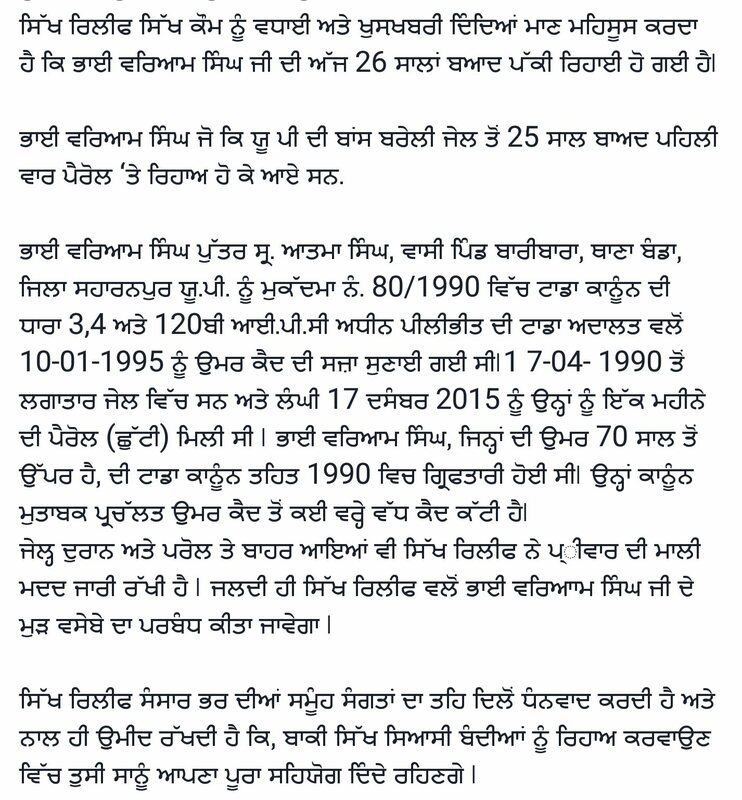 Bhai Waryam Singh was indicted under TADA charges in 1990. His elder son Jagdish Singh was 6 years and the younger one was 3 years old at that time. All of his land in village Shahjahanpur became ridden under debt during the trial of his case. His wife started serving a local Gurdwara Sahib. Currently, his elder son is serving as a Sewadar in Gurdwara Sahib of Pilibheet, while his younger son is appointed in a Gurdwara Sahib of Jalandhar. Sikh Man attacked in a Race Hate Crime in Chicago, USA.